It's mid June and the NBA Finals are upon us once more. Similar to last years showdown with the Mavericks, Lebron James will once again be leading his Miami Heat against an opponent built around a seven foot superstar who can hit the three point shot with ease. Unlike last year however, the team built around Kevin Durant is filled to the brim with players who would have easily been considered second best behind Dirk on the 2011 Mavericks Championship team. Players like Russel Westbrook, James Harden, and Serge Ibaka define the Oklahoma City Thunder and make them one of the more deadly teams in recent NBA history. Formed in part due to the economically friendly nature of the rookie contracts held by Ibaka and Harden, this Thunder squad has taken the West over by storm, dismantling the three former Western Conference Champions in the Mavs, Lakers, and Spurs. The perimeter trio of Westbrook, Harden, and Durant is lethal and is impossible to guard in the final moments of the game, and the dynamic front court duo of Ibaka and Kendrick Perkins provides excellent defense, crafty (albeit often illegal) screens, and bursts of offense when necessary. Together, this starting lineup has overwhelmed the Western Conference and barreled into the NBA Finals. But do they have what it takes to defeat the Miami Heat? Stitched together haphazardly in the summer of 2010, the Miami Heat led by Lebron James, Dwyane Wade, and Chris Bosh still seem to be looking for the proper group of role players to surround their trio of superstars. Suffering from average Point Guard play and down right awful contributions from their Center position, the Heat have still managed to limp into the Finals despite several instances where it looked like they may be eliminated against the Pacers and the Celtics. In my opinion, the Thunder are too much for the Heat to handle. Mario Chalmers, the Heat's Point Guard, does not have the slightest chance of slowing down the Thunder's Russell Westbrook. Dwyane Wade, who has been playing rather poorly lately by his standards will be challenged by the rising James Harden. Lebron James, considered by many to be the best player in the series, will have that title threatened by Kevin Durant. The injured Chris Bosh will be going up against the monster that is Serge Ibaka, and the ill equipped Heat bench will be facing the monstrous production of the Thunder's second unit. In my opinion this all points to a Thunder victory, though I still believe that this series will be a hard fought battle and I doubt that it is resolved in anything less than six games. 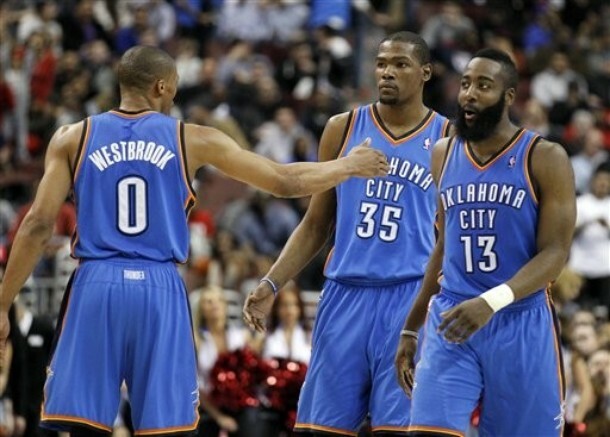 However, I would still be very surprised if the Thunder did not open the 2012-2013 season with a ring ceremony.